There’s something in the garden: a web of fluro pink and blue stretch across the walls. 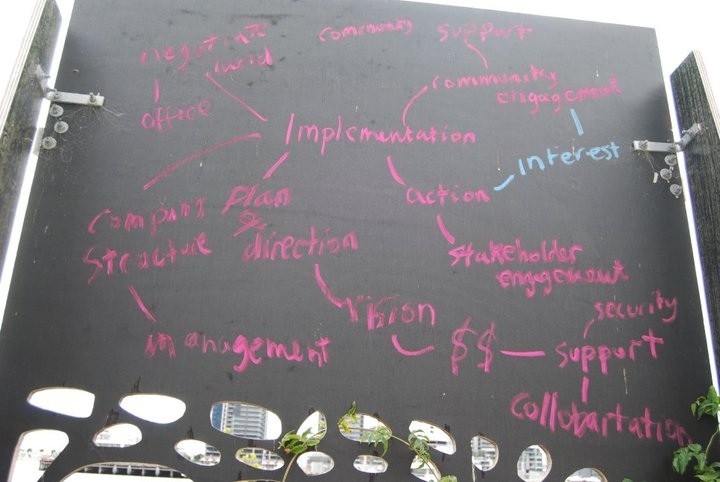 This web is a mesh of words and ideas like “belonging”, “social innovation”, “community” and “management”. But why is it there? And where did these ideas all stem from? Urban Reforestation’s project Target 3008, supported by the Victorian Government Sustainability Fund, is by now in full swing. We are now in the process of compiling information for a Final Report on the project: the web formed from a brainstorming process over Target 3008. 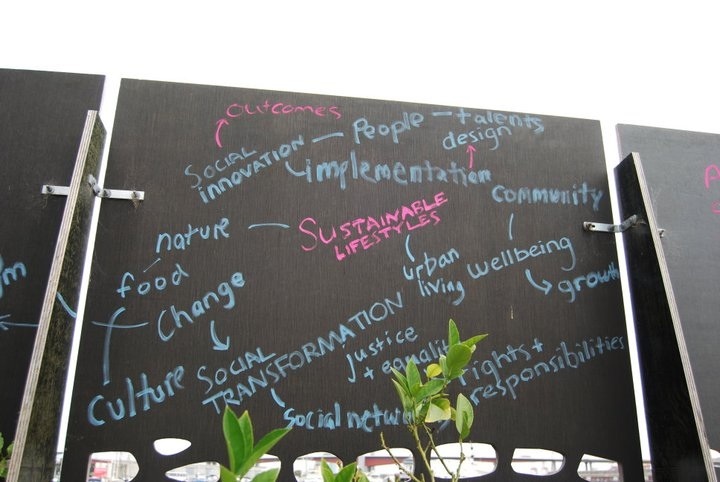 These words started with where the project grew from: sustainable lifestyles. From there it radiated out to incorporate ideas such as the social innovation and design necessary to base such projects on, as well as the paradigms and discourses around sustainability are being transformed. These ideas and concepts define the running of Target 3008, at times both nurturing and constraining. This made up the basis of the project: the ideology and rationale behind it all. The web spread, creeping across the walls, albeit in a more orderly fashion. We looked at the so-called “chapters” that make up Target 3008. People was the first chapter in the Target 3008 story. It is based on the community: in providing support for them, and in receiving support and care in return. 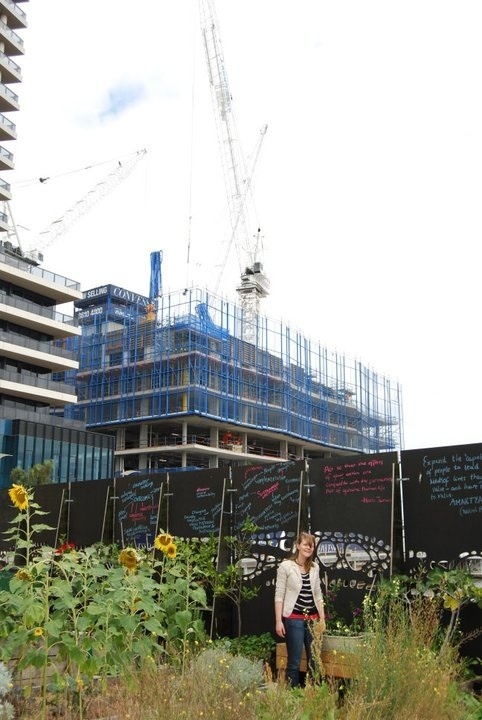 Importantly, Target 3008 aims to create a sense of place for the Docklands; to allow people to feel like they belong. 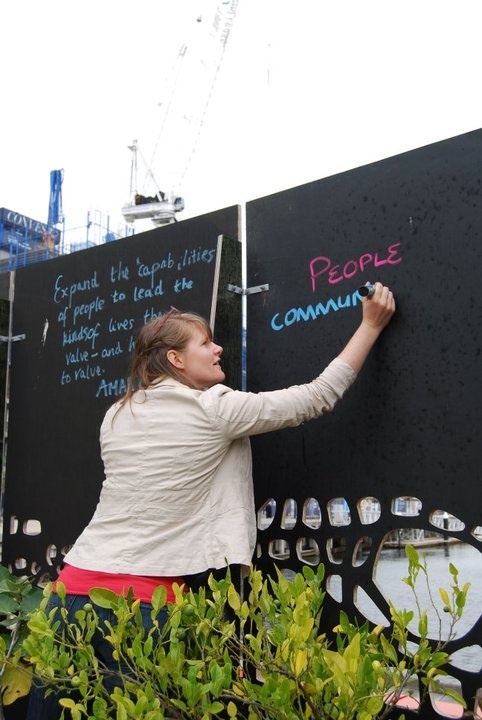 This will lead people to take ownership of place, and actively construct it to represent the community. This concepts feeds into the second chapter: interaction. Interaction is at the heart of the web and takes on many different meanings. 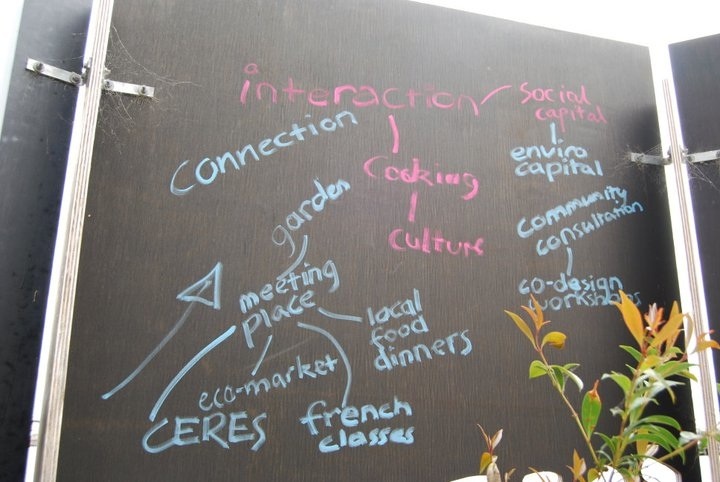 There is the interaction between people – the function of the garden as a meeting place, the interaction between Urban Reforestation and the community through co-design workshops and also the interaction with nature – through food and cooking. The environment makes up the third chapter: spanning concepts of urban ecology, food waste and compost, the changing urban environment and its impact of health and wellbeing. The fourth chapter consists of the implementation of the project: how it functions. This relates to action, engagement, finances and security. Chapter 5 details project obstacles, while Chapter 6 ties together the tools used to overcome these. The final chapter, number 7, elaborates the outcomes of the project; emphasising green spaces, connectedness, understanding and sustainability. And so the web that may seem like idle scrawls is actually embedded with both meaning and purpose. Target 3008 is growing and spreading. Older PostWhat's the link between sustainability and sailing?